A medium size, general purpose comparator with lifting lever for production line and inspection department. Has ample capacity and throat depth for medium to large size parts. Equipped with a granite base which is certified flat to within .000050”. Arm has I-beam cross section and is weight relieved. 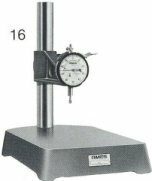 Indicator can be equipped with dead weight load for checking compressible materials to specs. See Model 135W on page 5. Has same arm column and Indicator as Model 13. A general purpose comparator with a ground, stress-relieved cast iron base having over 58 square inches of working surface. Can be drilled and tapped for mounting anvils and holding fixtures. 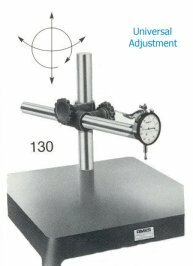 Popular comparator for checking compressible materials using Indicator with weight . The Ames Long Reach Comparator for large size work. Has over 140 square inches of working surface with rugged column and swivel clamp for reach adjustment of rugged arm up to 12”. Large locking knobs work independently to secure setting of arm length and height on column. Ground stress-relieved cast iron base can be easily drilled and tapped for holding fixtures. Minimum Grad .001" .001" .001"
Total Range .250" .250" .250"
Throat Depth 4" 4" 4"
Working Surface 8 X 8" 6 1/2 X 9" 12 X 12"
Height (overall) 11" 11" 11"
* Includes lifting lever. horizontal lug back. Total Range . Up to 1"
Contacts : - Any size or shape with 4-48 threads. For special contacts, consult Ames engineering. Accessories : - Tolerance hands, dust guard. Other : - Special size and shape anvils or platens and holding fixtures. 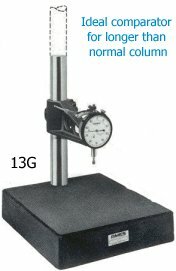 Longer columns -- up to 18"